If you’re going to be a good shot, practice is imperative. Lots of practice. To make lots of practice comfortable and positive, the wise shotgunner uses low-recoil practice loads. This is especially important for those practicing with the same light double guns they intend to use when hunting. 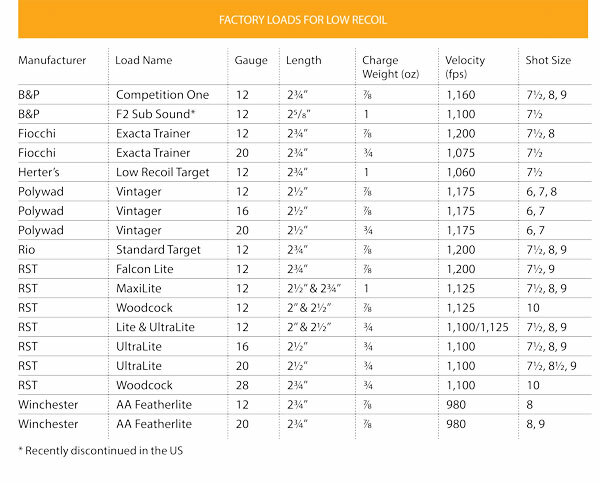 The accompanying table lists what I would classify as the currently available low-recoil factory lead loads that would be of most benefit. If you push around the free-recoil equation (Shot Talk, May/June ’08), it soon becomes apparent that in any shotgun weighing less than 7 pounds, free recoil has to be kept below 18 foot-pounds to be comfortable. This means that in 12 gauge, no load heavier than 1 oz at a velocity higher than 1,100 fps would be tolerable for sustained practice in light guns. Lighter shot charges—7⁄8 oz or even ¾ oz—would be better yet for 12-gauge loads at no higher than 1,200 fps and still better at 1,100 to 1,150 fps. If you are a 16-gauge shooter, there are currently only two loads—a 7⁄8-oz Polywad and ¾-oz RST—that fit my definition of light recoil. In 20 gauge I’ve found four loads from four manufacturers featuring ¾-oz lead-shot charges at velocities of less than 1,200 fps and one 7⁄8-oz Winchester AA load at only 980 fps. In 28 gauge I have found only one—an RST 2¾”, ¾-oz load at 1,100 fps—that would be even lighter-recoiling than the standard 28-gauge ¾-oz lead load at 1,200 fps. Worry not that practicing with velocity levels at about 1,100 to 1,150 fps will negatively affect your shooting when switching to 1,200-fps-or-faster loads. From tests I have conducted with thousands of shooters worldwide, the data show that learned forward-allowance sight pictures are not significantly altered until the velocity differential between practice and hunting loads exceeds 150 fps. For this reason I caution hunters who shoot 1,200- to 1,300-fps loads against excessive practice with loads slower than 1,000 fps. If you’re after the absolutely least-expensive low-recoiling target loads, your best bet always will be to reload. 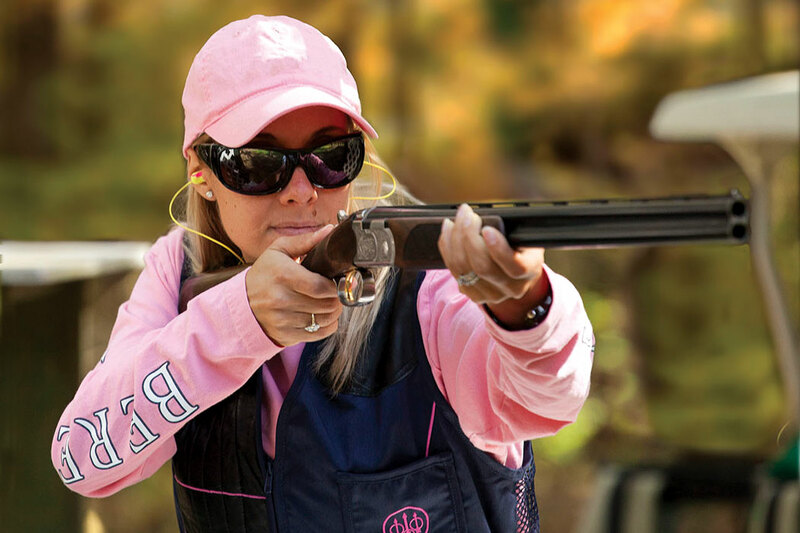 For practice on clays where gun-to-target distances are no greater than about 35 yards, lead No. 8s would be the best all-around pellets. Certainly No. 7½s and 7s will get the job done at these distances even in the light-shot-charge weights listed in the table. The No. 10s in the two RST woodcock loads will break clays reliably at less than 30 yards as well. A last thought: Several of the loads listed in the table are specialized hunting loads and thus sell for a pretty penny. 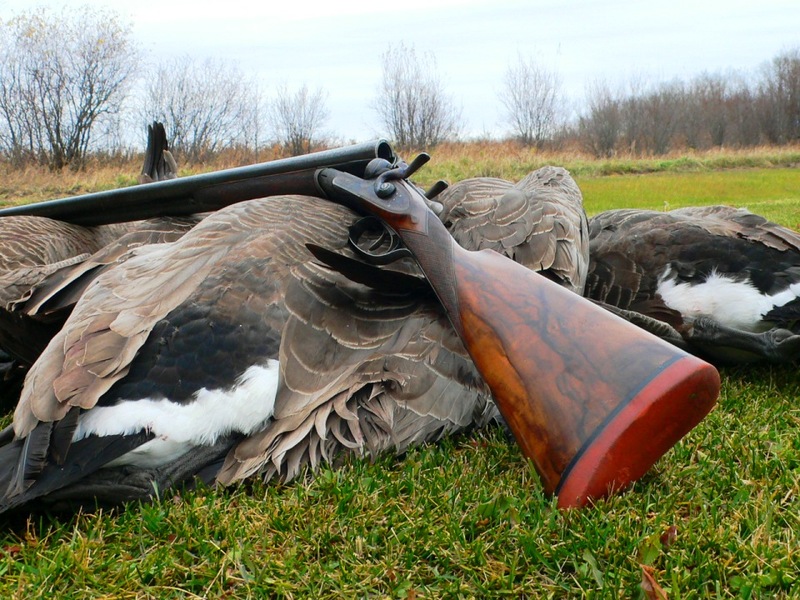 The least-expensive factory load that qualifies as low-recoiling in my table is the Herter’s 12-gauge load, followed by the Fiocchi and Winchester loads. But if you’re after the absolutely least-expensive low-recoiling target loads, your best bet always will be to reload. Clever has 12 ga., 24 gram international loads that are very low recoil (T1 Super Target). Claimed velocity is 1310 fps but that is by the European method which likely means about 1200 fps by U.S. SAAMI methods. Mate, your on the money. I use Lyelvale express 7/8 oz 21/2” in #9 English out of my 6lb Dickson for most of my quail shooting over Irish Setters, if very windy I use 1oz 71/2. Our Australian Stubble quail go like rockets, I have had the privilege to shoot wild Bobwhites in Texas, bloody awesome but Stubbles leave them for dead in speed and flight distance. What about the drams of powder in a shell? I would think that it has something to do with recoil. Clever Mirage 20 ga Lite loads are 3/4 oz of 8s at 1200 fps. Hard to find but worth it. I bought a bunch last summer to baby my torn rotator cuff and they are great on doves. note that a few yrs ago I bought several flats of 12ga 3/4oz ammunition made by Rio.They are awesome. If I could get my hands on 10’s of flats I would.